ERP is an inner managerial strategy which is focused on more elaborate usage of a given company’s resources, integration of business tasks, and streamlining processes. The strategy is realized by specific software. Means, an ERP system is an application created for enterprises which want to optimize their business processes. Even small and midsize brands can benefit from ERP but it’s totally obligatory for large corporations. Further, we’d like to highlight the best ERP software companies in Dubai for entrepreneurs from this region. As well, we will look at some important basic things related to advantages of ERP apps, implementation processes, and differences between ready-made and bespoke solutions. Be sure to check this guide if you want to boost your UAE-based business with advances software but aren’t sure about exact benefits or pitfalls. Applications for Enterprise Resource Planning are beneficial for almost all market sectors but their real usefulness varies depending on business sizes, objectives, and even locations. Let’s say, a small team of publishers in Troyes, France can be successful without complex solutions because the company will rely on in-person interactions, mostly. But midsize (or even large) finance corporation in the USA can hardly exist without ERP apps. Construction. The software helps with inventory management, document flows between customers, builders, and subcontractors, as well as in tracking deadlines. Electronics. Similarly, ERP can help with equipment and schedules when it comes to high-tech industries where quality is vital. Healthcare. Apps unify and organize patients’ data making it protected and accessible for involved doctors or facilities. This can save a life, literally. Manufacturing. Here, ERP facilitates interactions between departments greatly. Accountants, creators, suppliers, and customers are united in a single system. Retail. Probably, this industry benefits the most because of the automation of daily tasks and optimizing sales, shipping, marketing, and payment processes. Generally, the market of ERP systems in UAE and Dubai grow. As TechSci Research reports in its 2017 study (subscription needed), an overall CAGR in 2017-2022 should be 13% with more attention to cloud ERP software development instead of on-premise apps. Before we proceed to examples of ERP software companies in Dubai, let’s think about the usefulness of the mentioned applications and their potential for businesses. 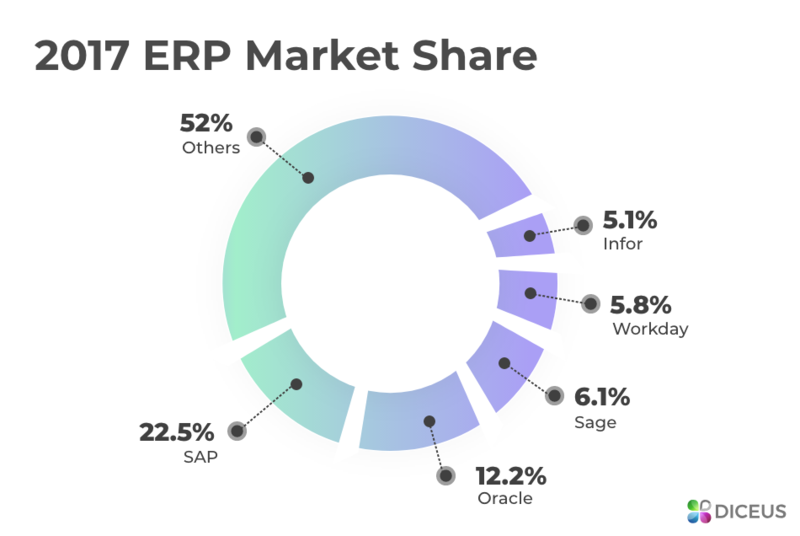 Generally, ERP solutions have great advantages for companies with at least two departments each of which utilizes unique software. Say, accountants can track payroll in Excel while salesmen use modern CRM to contact with clients. 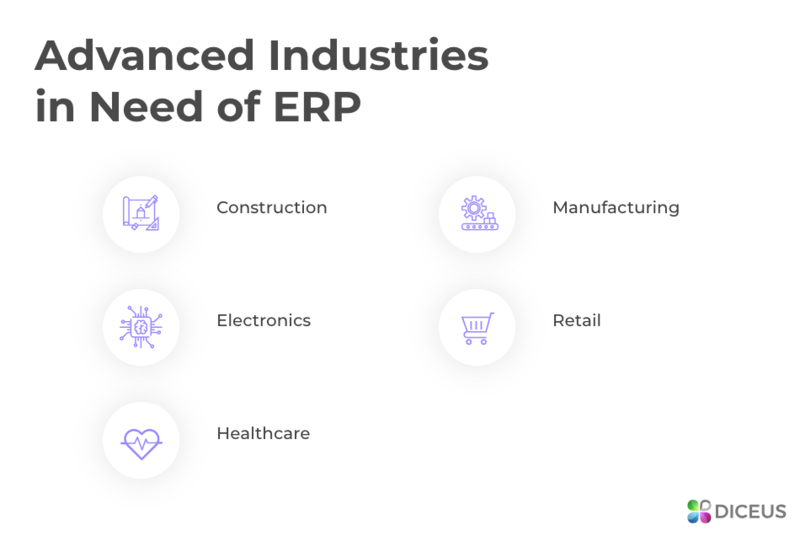 To connect these branches, ERP solutions create a single database and automate various minor processes. Data accessibility. The data becomes accessible at one whack. You don’t need to verify it with others or input several times. Data consistency. A common database allows avoiding the verification stages and increases the data consistency for all employees. Work progress control. When one department modifies the goods/services lifecycle, the other department gets notifications and sees changes. Human errors reduction. A single system won’t allow writing off goods from the wrong warehouse, mistyping a client’s info or paying to a partner twice. Tools for MNCs. Worldwide enterprises have to work with various currencies, languages, and time zones. ERP apps convert and arrange everything quickly. But not only global businesses can launch ERP solutions Dubai. For instance, if you face problems with too complex accounting processes or have troubles in meeting schedules, consider installing an ERP system. As well, all-in-one products which come with integrated CRM software are useful for boosting customer experience. 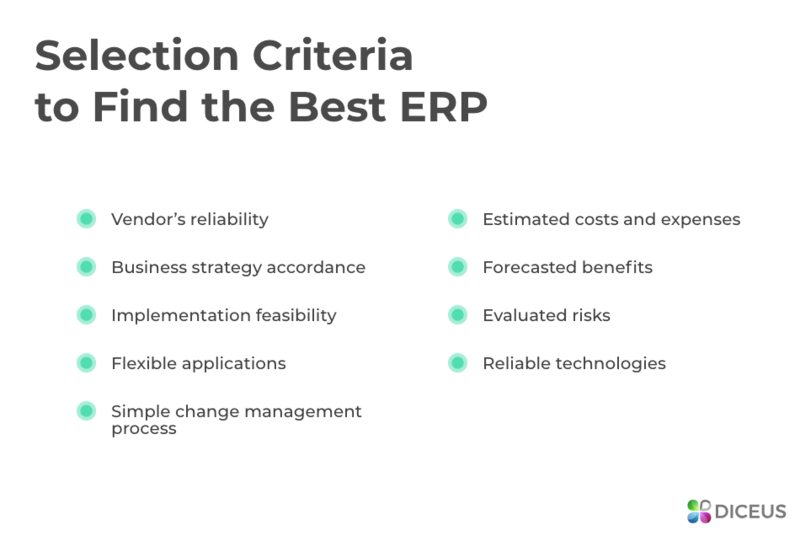 To clearly understand how your business can benefit from getting an ERP system, it’s required to know the differences between two major software types. On the one hand, we have out-of-the-box (OOTB) or ready systems. They’re just like premade sandwiches in Subway which you can order quickly and satisfy hunger. Subway chiefs know which sandwiches people like the most, so they add foods in the menu to streamline the selection process. With software, things work the same way because vendors know which ERP modules are desired and the most efficient. Prepackaged solutions are convenient when you don’t have time or knowledge to customize software but they rarely meet your needs perfectly. It’s like a wonderful sandwich which you really love but also understand that it’s not perfect. Say, there are olives. Or, contrary, there aren’t your favorite fresh tomatoes. ERP packs also can feature redundant stuff or come without some necessary functions. Instead, custom applications are all about choosing each ingredient from bread (software basic technology) to sauces (final design/interface features). Bespoke solutions let you adapt them to exact demands and current business goals. Developers of such software deliver each project from scratch, add, remove or replace modules according to your desires exclusively. They also provide for post-launch support and upgrades. Functionality. OOTB apps often come with sets of features which may be insufficient or superfluous while bespoke systems include only required things. Extra features. Simply put, you have to pay for all extensions of OOTB software but can include all costs plus lifelong support in the final contract. Ease of setting up and use. Prepackaged ERP systems are simpler than comprehensive tailored analogs. However, with proper training, custom apps are simple, too. Availability. The market leaders reviewed below deliver ready-made solutions, mostly. To find a good custom developer, you will have to spend more time. Price. Because of features’ templates and plain integration, OOTB systems are cheaper but they feature more expenses on next upgrades than bespoke ones. Read more about ERP prices for different industries. SAP. Held 33% of the global share in 2004 and had 22.5% in 2017. Oracle. The share was 18% in 2004 and turned into 12.2% in 2017. Other members of the Musmar’s so-called «Big Five» (Baan, JD Edwards, and PeopleSoft) lost their leadership. Apart from the global vendors that distribute their products all over the world, there are several high-profile teams from Dubai and UAE as a whole. Abacus IT Solutions is an ERP merchant based in Dubai and Sharja. The company is considered to be the leading creator of business management software packages since 2004. Abacus delivers various apps’ types including not only ERP but CRM software, HRMS, fixed assets management tools etc. Diceus is a global company which acts as a technology partner instead outsourcing models. The team works in various industries from insurance to finance to sports to travel. Diceus handles all stages of the development process including analysis, MVP creation, upgrading, deployment, and support. In details, we will look at use cases further. Adept Business Solutions develops ERP online software and implements applications for different industries. It delivers tailor-made products, tools for HR managers and accountants, CRM, and more personalized programs. The company provides for wholesome consultations, staff training, and support. Axolon ERP Software deploys user-friendly, customizable products with essential functionalities and reporting tools for businesses of all sizes. The ERP modules offered by the company include inventory, sales, distribution, payroll, finance, and accounting software. The team claims that clients can use only its solutions without need in third-party apps. CBS is one of the largest examples of ERP companies in UAE. It has offices on Middle East and in India, delivers all the core enterprise solutions including top-notch tools for SCM, market forecasting, and business intelligence. CBS is well-known for its RealSoft app which consists of several efficient inner and external modules. Representing top ERP software companies in Dubai, Ezware Technologies handles an impressive list of development tasks from initial analysis to lifelong maintenance. The brand launches programs for inquiry management, fixed assets management, job estimations, customer interactions, equipment, and inventory management, to name a few. FACTS is one of ERP vendors that do nearly everything. You can order ready-made or bespoke all-in-one managerial applications for construction companies, HCM, WMS etc. The company has more than 1000 finished projects, 500+ clients, and famous partners such as Microsoft (thus, developers help in implementing Dynamics 365). One of a few VAT-compliant best ERP software providers, FirstBIT creates solutions for small, midsize, and large businesses of different industries. From accounting to inventory and from bespoke cloud products to best practices-based on-premises apps, the company provides implementation, maintenance, and upgrading services in UAE. Focus Softnet increases awareness about Emirates-based companies thanks to its presence on 17 markets and long history of 27 years. Developers have created ready-made apps for WMS, MRP, CRM, and HCM which can be realized in retail, manufacturing, logistics, real estate, and even education. Here’s another big team which has been working for 22 years on Middle East. Pinnacle handles developing of ERP solutions Dubai, supporting clients, and providing consultations. On a par with traditional markets, the team works in government sector, oil and gas industry, hospitality, healthcare, and media. Zenologics is a relatively fresh brand which already has near 100 successfully deployed ERP modules. Authors focus on enterprise solutions and HRMS for traditional industries but they also are known for top-notch back-office products. They also provide for comprehensive business evaluation including ROI estimations and forecasts. Zeta Software was founded in 1997 and now is headquartered in Dubai with offices in the UK, Kenya, and India. The team provides ERP online apps, HRMS, and CRM products, various tools for e-commerce, and so on. Among other approaches, Zeta Middle East creates software for retail POS businesses. As you can see, a lot of vendors offer both prepackaged and custom ERP apps. Considering the higher flexibility of the latter ones, we suggest choosing a reliable provider which will be able to tailor modules to your needs. Our company specializes in advanced software solutions including ERP apps for different industries. We come with a fully personalized approach, analyze your business processes, and share ideas about the best ERP software for your brand. Following the Agile principles, we create MVP examples to help you understand usability before ordering the final product. Obviously, we don’t ask for hourly payments because our developers deliver software on-time and don’t have to worry about delays. Teambase. This solution designed for HR staff features payroll and recruitment management, single data storage, and tools for administrators. Teambase allows tracking all HR tasks but also provides for complete performance analysis. FSA. An interactive platform for management of various employees/employers benefits features both front-end and back-end tools like custom ERP modules, compatibility with external apps, content access and editing, and great data protection. Insubiz. For insurers, we have created this all-in-one system which allows underwriters to manage their clients’ interactions and customers to access their insurance packages without unnecessary third-party connections. The usefulness of this system and how it helps in increasing work efficiency. The ease-of-use of the system and how user-friendly it is. 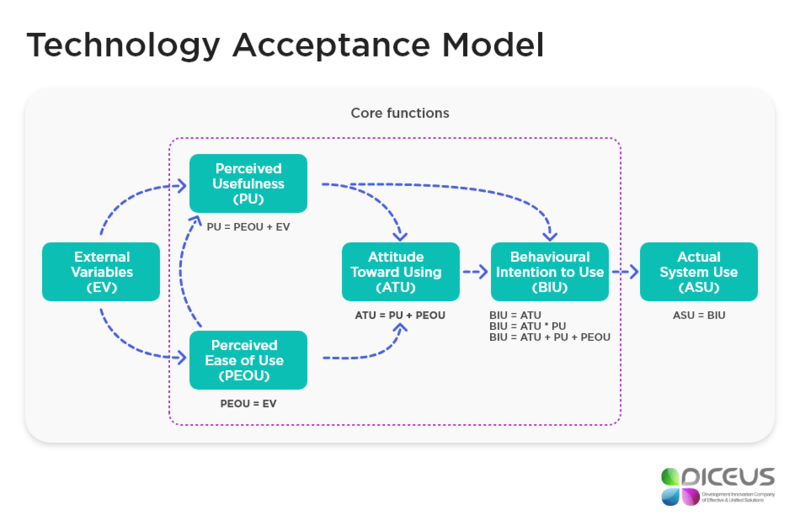 These factors are featured in one of the most popular studies – Technology Acceptance Model (TAM). It’s known to be the most widespread model that is used in predicting the user acceptance of IT systems. Look at the scheme below to understand how things work with TAM. Don’t be afraid of the complexity as now you only should remember that it’s essential to evaluate the usefulness and the ease-of-use of ERP systems before implementing them. Further, don’t forget about a proper integration team. It must include representatives from each area that is covered in stand-alone or cloud ERP software plus key users, influencers, IT staff, and project managers. The methodology should take into consideration the business processes and the product’s outcome, in addition to the normal software criteria of selection such as user-friendliness, functionality, cost, and implementation time. Ensure in the vendor’s reliability. Fit the business strategy and processes. New ERP systems are mainly used by non-technical business users. These systems interfere with their daily work activities and with the way they perform their jobs. In order to get the promised ROI, it’s not enough to build a robust system that performs great functionalities. Users should feel comfortable and happy about the system, mainly. That’s why we recommend evaluating financial, strategic, and UX/UI aspects when choosing ERP companies in UAE. As you can see, it’s crucial for businesses to select the right ERP vendors in their region, particularly, in Dubai. The company should meet all the business needs and requirements of your enterprise to successfully deliver and implement the solution which you expect to get. A good ERP development company must consider all the specifics of your work in a comprehensive business analysis which further can serve a strong basis for the rest of the software development life cycle. In case you still have any questions about ERPs, development or implementation processes, just consult with our experts.